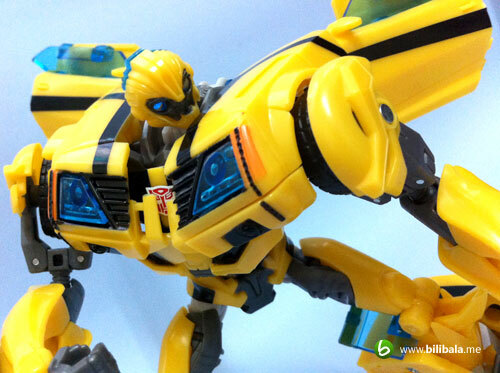 The yellow dude, Bumblebee, who is almost everyone’s favorite has made a come back (not surprisingly as he is in almost every episode of Transformers movie/cartoon just like Optimus Prime) in Transformers Prime. 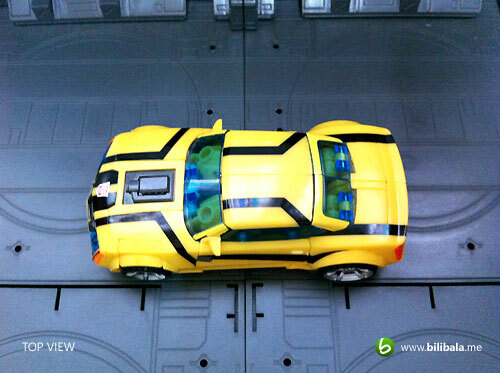 Camaro was his history suit and he is now in a bright and shiny new armour with newly designed sport gear which will rev your enthusiasm again for him. 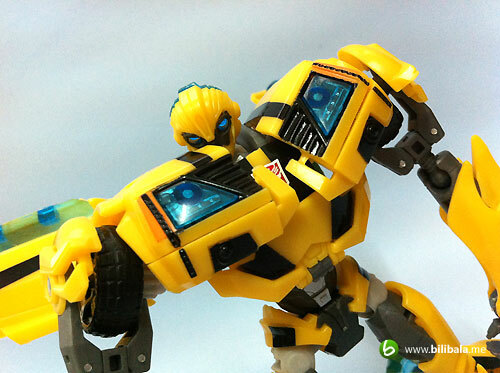 What’s more, he is still the adorable bee that you always wanted to see. Read on! 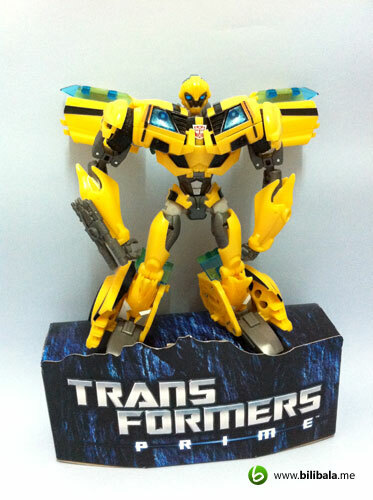 Much like the Prime Arcee, it comes with a paper based display stand and separate arm cannon. As mentioned before, the paper based display stand does not bear any unique character name and it is generic throughout as bundles to the deluxe classes. 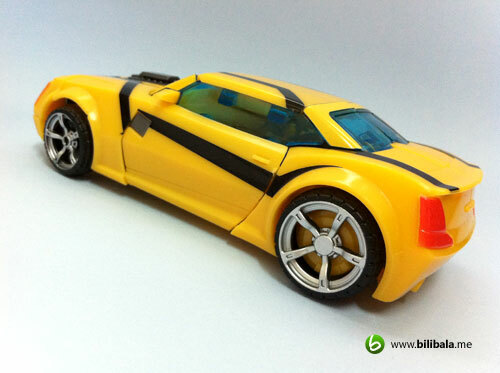 Instead of being Camaro or the old Volks Wagon, Bumblebee get a new ride which is a futuristic (it does look like a futuristic Mustang muscle car to me) unknown sport car. 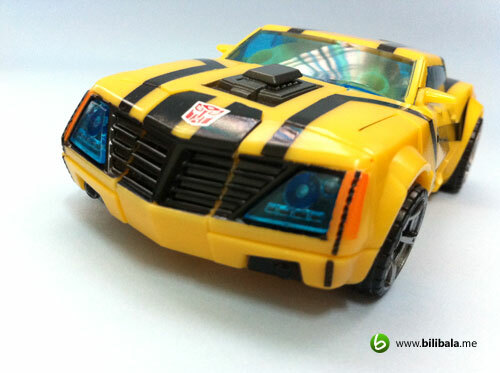 While the color scheme remains the same yellow from the movie series, it has nice running black line decal all over the car body. For this new line, you will get to see much nicer treatment such as the generously usage of cyan transparent plastic for the car headlights and all window screens. 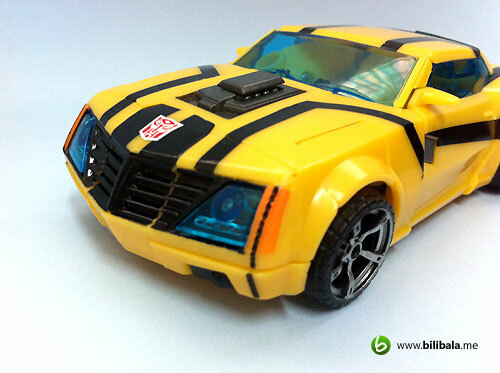 Paintwork is of top notch, which Hasbro really did a good job in ensuring the great and finer painting, lesser paint chip and “out of line” paints. 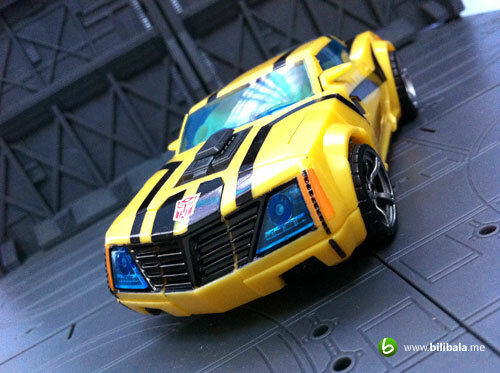 The Autobot insignia clearly and prominently outshines itself in front of the hood of the car. Nice details and metallic silver painting on all the sport rims (really nice!). And oh yes, your eyes didn’t play trick on you. 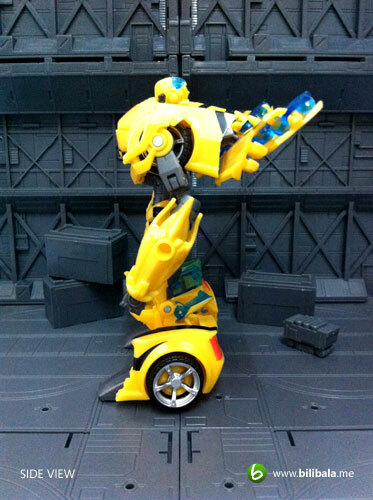 The rear wheel is actually bigger than the front wheel. Well, that’s how it looks like in the series too! 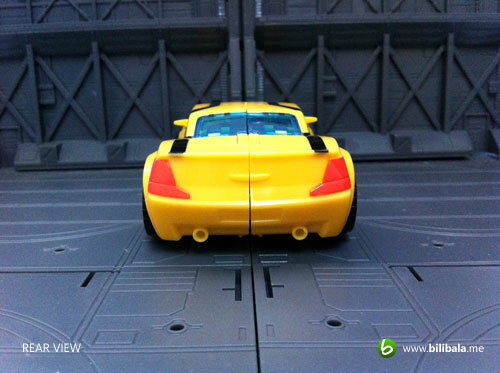 The treatment for the rear is somehow contrast to what it is in front. You will only see cheaper red paintings to represent the back light of the car and there is no painting on the sporty muffler he has. Definitely a let down in detailing. It would be nicer if they use those transparent red plastics to replace the back light and silver metallic painting to the muffler. 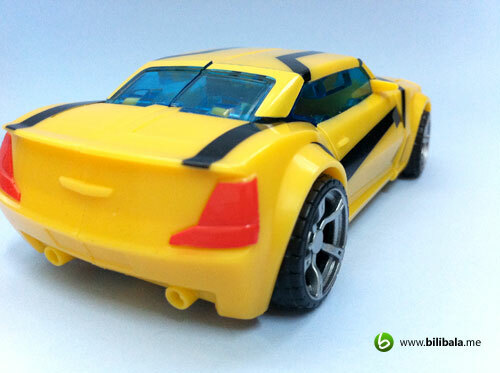 From top, you will see the nice black coloured streamlined running-line decal over the car which really fits in nicely with the yellow coloured body. 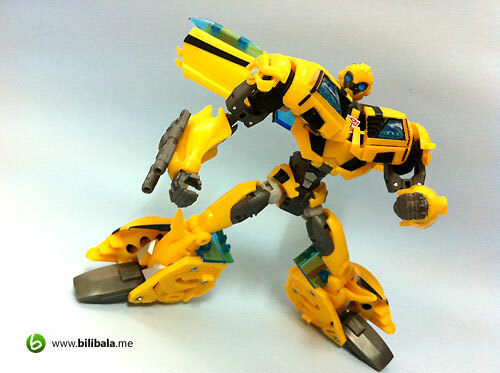 The robot mode of Bumblebee is quite “bulky”. Having almost the same height as Arcee, it has wider spread of shoulder width. And of course, it is near perfect movie accurate as well. 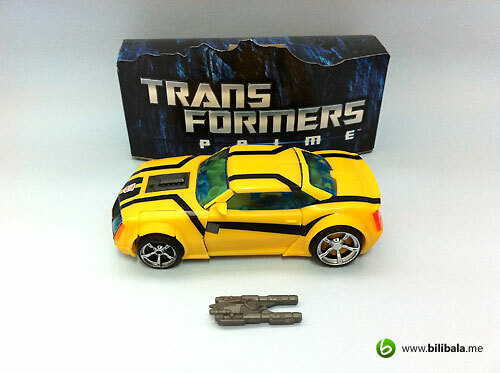 Kudos to Hasbro on that. 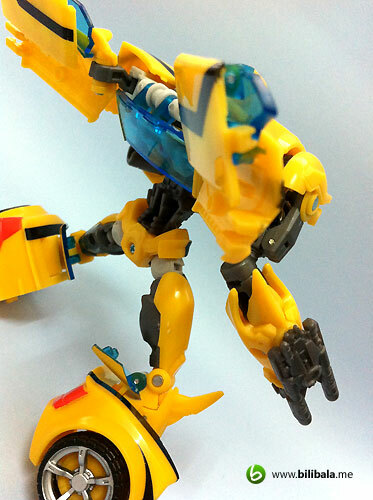 Articulations are much like the Arcee where you have an additional swivel ball joint for the head ( up/down swivel movement to perform action like nodding head) and a waist joint. 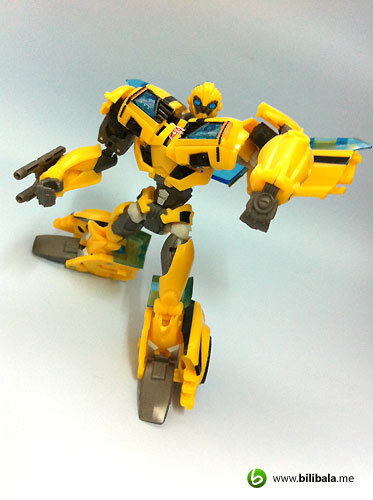 The rest of the joints are pretty standard and make pose-ability a fun moment with him. 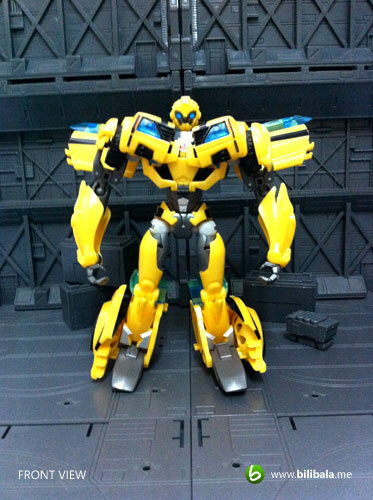 In the meantime, this Bumblebee has do away with the heavy “backpack” design which gives him a balanced body to weight proportion. 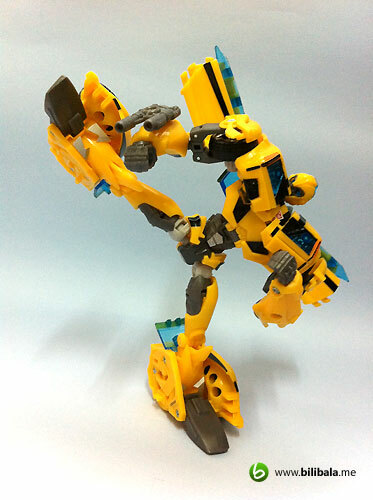 However, the design for the leg which is quite squarish and blocky may hinder some of the pose-ability and make him quite difficult to stand in certain position. 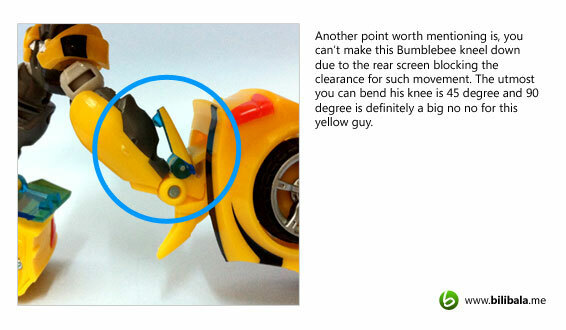 If they add an ankle joint to the leg, it will open up more flexibility and stability for this little guy. 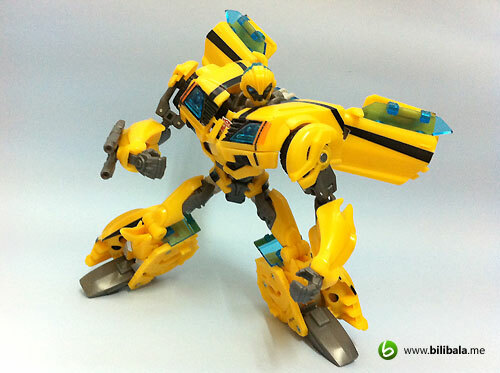 A bit off topic, the overall yellow + black line design does remind me of Bruce Lee wearing his favourite yellow kung fu suit. Any resemblance? 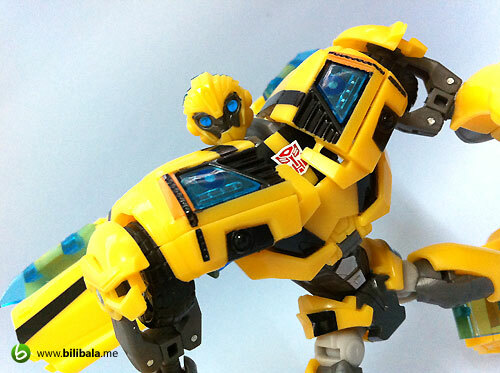 From the side profile of the robot, you will not see any “backpack” design. 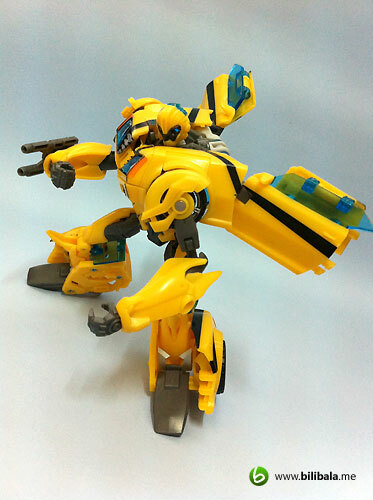 Both of the doors appear as “wings” to the robot. 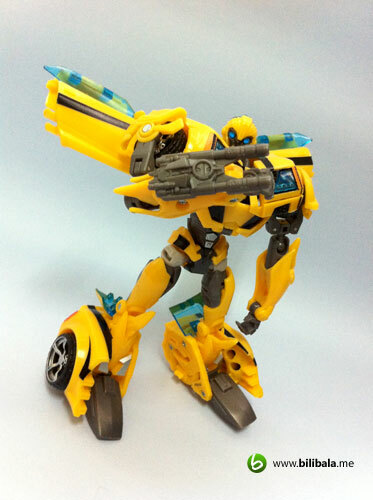 Bumblebee also has “hands” with non-movable fingers design, just like Arcee. Not much additional color painting you will see here. 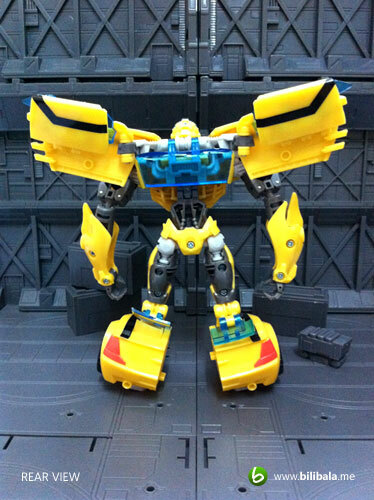 Those black/light grey plastics are just the raw color of the plastic. 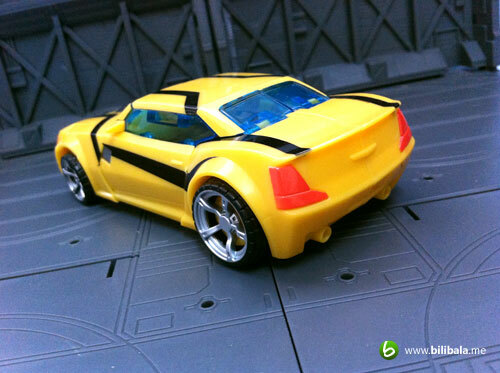 See how both of the line decal fits in to the “wing” of the Bumblebee. Nice. 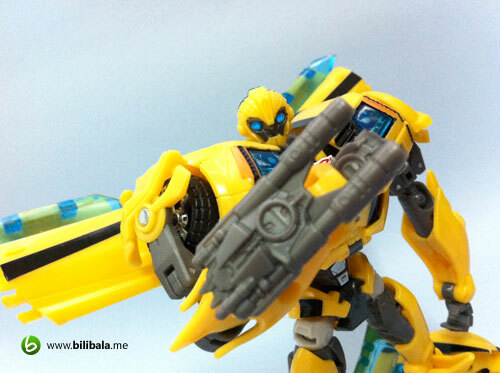 Much like Arcee, you will have the same “iris” design on Bumblebee eyes (not very obvious in this picture, but you will notice clearly in actual toy where 2 pointy “LED” like structure in the eyes socket). The light pipping works exceptional well in bringing the life into this collection. This is what make me loving Prime toys more: the lifelike and finer details on their head piece as if makes you feel like they will start talking to you. 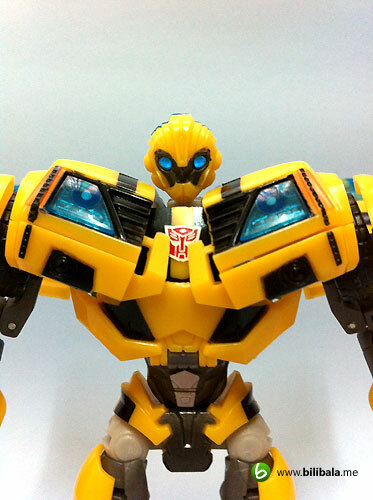 The same Autobot insignia you have seen in the alt mode will be nicely transformed to the position on the chest part of the figure which kinda synced with position of Arcee as well. 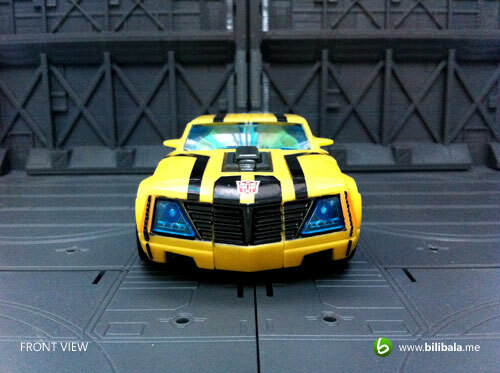 I wonder whether all Autobots will have the same insignia position in their robot mode? 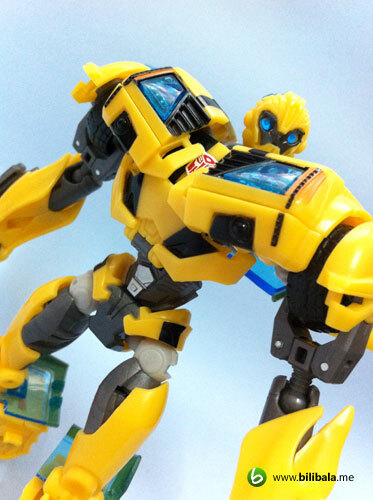 Transformation is quite intermediate and in fact for the initial transformation, you might need some skills unplugging those pegs off their connector points. Believe me, there are bunches of pegs which you need to slowly and gently unplugging without breaking them. To name a few, the leg section pegs for both sides (rear wheel to door peg) and top of the car peg (see “step2”) . 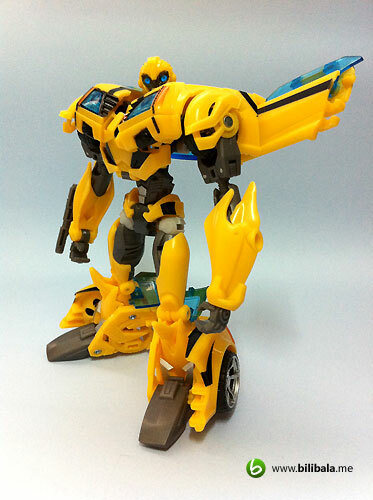 And while transforming back to robot also, you might need skill and some time plugging the same pegs again. 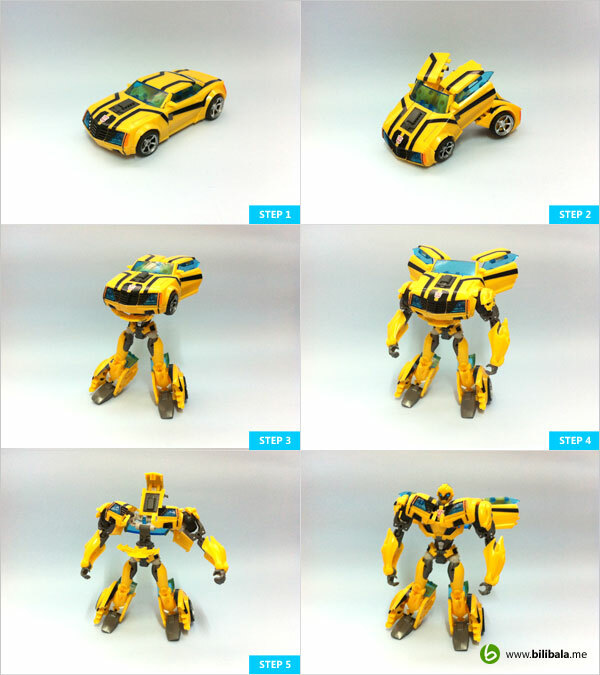 Some random shots on the yellow dude. 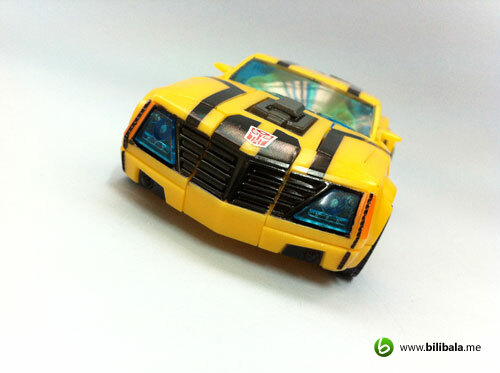 Starting with the yellow alternate mode. These rims will carry you away! 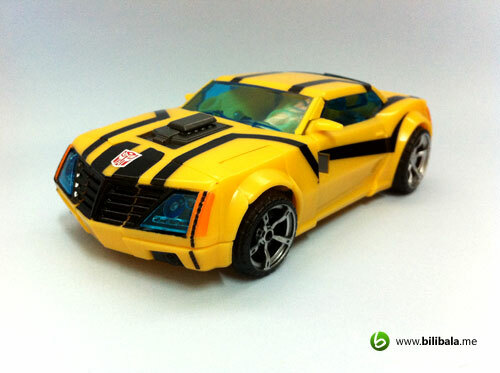 Here’s some with robot mode. Though i only have one arm cannon, i have 2 hidden wrist cannons here! See! See me kicking like Bruce Lee! Dont mess with me! Watcha!!! 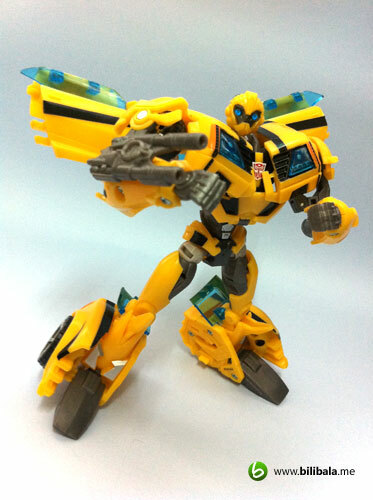 The only weapon he has, the arm cannon, why does it only comes with 1? instead of a pair? Where does the 2nd one goes? 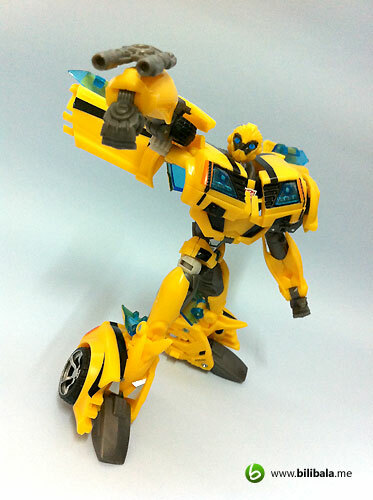 My favorite heroic pose of Bumblebee, as if he is preparing for a dash. Another piece of great collection. 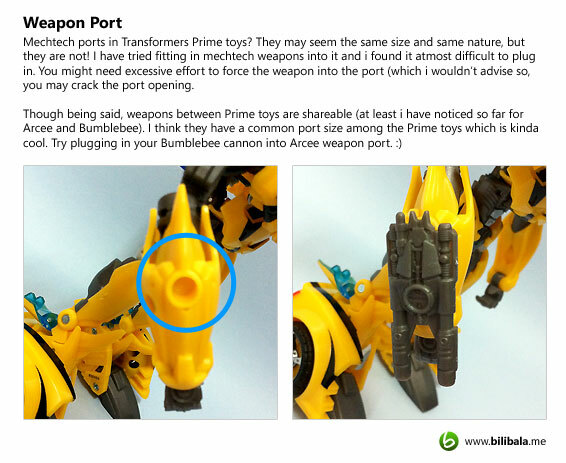 I guess i will be saying the same throughout reviewing all the Prime toys as i really love them so much. However, some of the very subjective opinions on how the legs and knees are design does spoilt a bit of the posing fun (and not to mention, 1 cannon only??) So my overall PCR (personal collection rating) is 8.5/10. 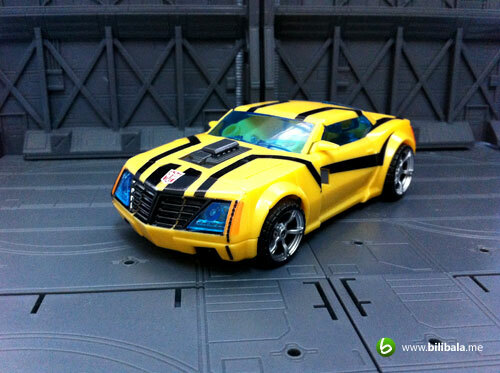 It does have nice paint work and movie accuracy though. Until then, enjoy hunting and hauling! Oh ya, don’t forget to like this post too! Bro, i think u miss one spot of transformation. 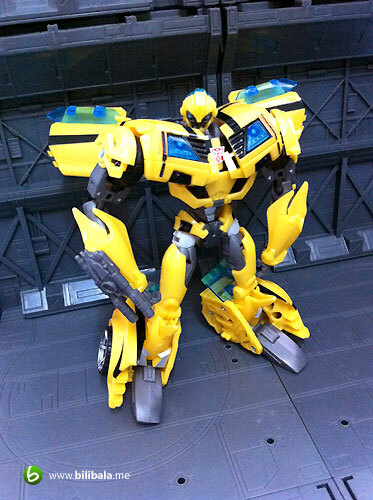 The shoulder pad and wheels can be face front. u need to twist a bit. then he will be show accurate more. 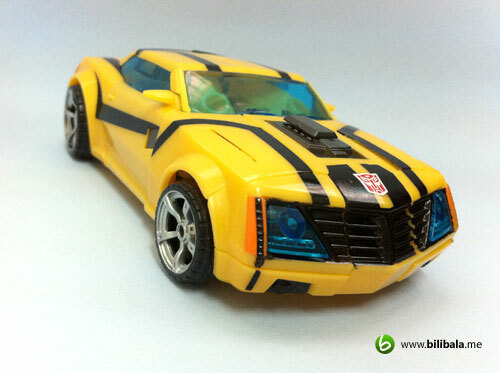 an animatic rendition of the big screen's bumblebee and does not disappoint! Great review as usual bro!